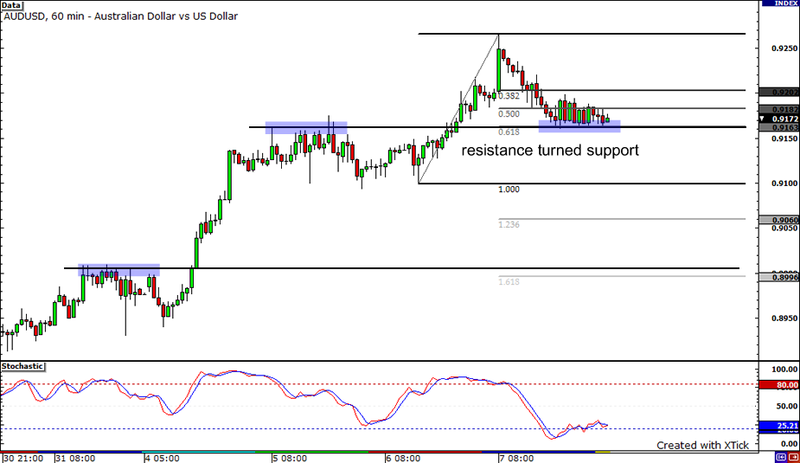 Take a look at the AUDUSD 1-hour chart I posted above. After breaking above the minor resistance at 0.9160, the pair seems to be finding support at this level. Coincidentally, this lines up with the 61.8% Fibonacci retracement level. Right now, the pair seems to be in a tight consolidation mode, with the stochastics struggling to climb out of the oversold area. If the support level at 0.9160 holds, the pair could rebound up to the previous day high of 0.9266. But if the pair breaks below support, it could slide down to the psychological 0.9100 handle. And if the 0.9100 level is breached, the next support level in sight is at the broken minor resistance near 0.9000. Here’s an update of the NZDUSD chart that I drew the other day. 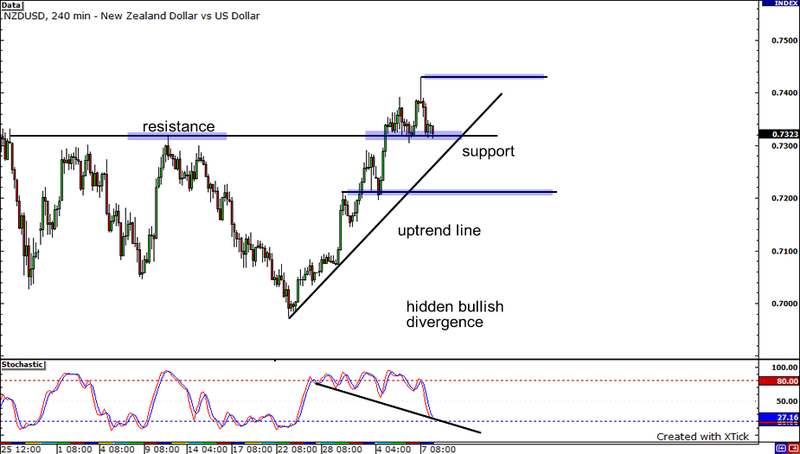 A bullish hidden divergence, where the price makes higher highs and the stochastics plot lower lows, can be seen on its 4-hour chart. This suggests that sooner or later investors could jump in and buy up the pair. Presently, the previous resistance just above 0.7300 is acting as a support. It’s possible for it to reach yesterday’s high should it bounce from this support. But if for some reason the support at the previous resistance and the short term uptrend line break, the pair could find itself down to around 0.7200. 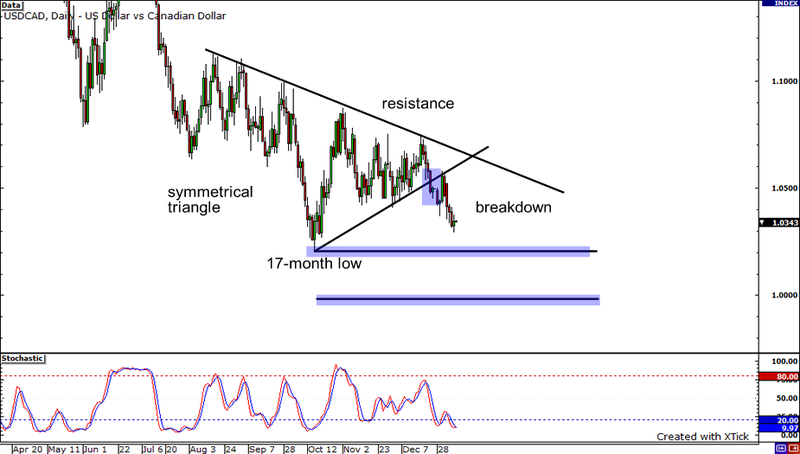 Next is the USDCAD on its daily chart. As you can see, the pair has recently broken down from a symmetrical triangle pattern. Its next level of support would be at its 17-month low at 1.0206. Its minimum downside target (computed by projecting the height of the formation from the point of breakdown), however, would be at par level 1.0000. But if dollar buying interest shows up, the pair could rise all the way up until it hits a wall at the triangle’s resistance.